Soy is the way forward that's why! Soy candles burn cleaner than paraffin candles. Soy wax is a favourite of environmentally conscious folk because it's not made from petroleum and won't increase the CO2 level in the atmosphere. In fact, if you had to eat this soy base, minus the scent, you could (we are not suggesting that you do however because we add scents)! How long do soy candles burn? It depends on the size of candle, but soy candles last longer! They can last up to 50% longer than paraffin candles and don't burn as much soot. How long has soy wax been around? Soy wax was only invented in 1991 by Michael Richards. He was trying to find a cheaper alternative for beeswax. Are your candles all natural? Do your wicks have lead in them? Yes and No! Yes, they are made from 100% soy wax, so they're completely vegetable based. The wicks are 100% cotton they have no lead in them. 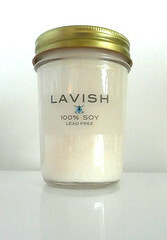 100% soy candle with lead free wick. Choose your scent! Glass jar adorned with a swarovski crystal. 100% soy candle with lead free wick. Glass is tempered and measures 2.75" high x 4" diameter. Ask about bulk purchases for weddings, or other events. So many scents to choose from!